The roughly ten-kilometre sized cloud filled the field of view of some of the sensors on board LCROSS, resulting in good measurements of the composition of the lunar regolith. 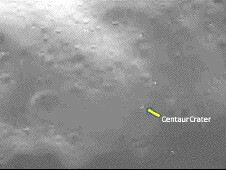 One infra-red image, taken by LCROSS from a height of just 10 km, shows the floor of the Cabeus crater for the first time, including a fresh crater from the impact of the Centaur upper stage. 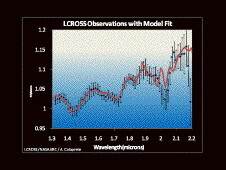 The initial results from the spectra obtained by LCROSS show deep absorption features due to water, implying that there was roughly 100 kg of water in the field of view of the instrument, approximately equivalent to a dozen or so 2-gallon buckets. As well as water, the spectra also show absorption due to several other compounds, the identities of which are yet to be confirmed. See all the images from the press conference here.